The major structures of the magnificent city of Fatepur Sikri is located right at the top of the ridge of the Vindhyan range, to highlight the sense of magnificence or even more mundanely, as a logical defensive action. These include the Mosque complex at the highest point followed by the Royal complex at a lower level and still lower is the Public complex. Yet, where did the other common citizens figure in this ‘royal’ scheme of things? Where did the numerous artisans, carpenters, masons, cobblers, fortune tellers, jugglers, workers and their like live? The present settlement pattern perhaps gives us a clue as to how the ‘commoners’ were housed in this city of royals. All along the slope leading up to the top of the ridge are narrow winding alleys perched on steep slopes with gorgeous little houses, all pathways winding & leading up to the central complex on top. The steep slope is broken down into different levels which house the common people...quaint little houses painted over in green, white and yellow still sporting symbols from old...ornamental brackets, sandstone walls, chajjas, intricate cornices, the post and beam system used in the main complex...all remarkably preserved from posterity...people still reside here...little children still run around through the little alleys... There are glimpses of the top of the magnificent Buland Darwaza seen from above the roof tops, towering over as a silent presence. Yet, it is a little bit unimaginable to think that these houses have lasted for over 5 centuries without total disintegration. The detailing however seems to point otherwise. Fatepur Sikri is situated on an extension of the upper Vindhyan ranges, on the bank of a large natural lake which has mostly dried up, on a ridge which is composed of red sandstone formations. The great emperor Akbar created a grand city, the first major town planning exercise by the Mughals, and shifted his residence & court from Agra to Sikri in 1572. The main reason for shifting is said to be due to the presence of Sufi saint Salim Chisti residing in Sikri. This was one of the most productive & formative period of Akbar's reign, during which practically all his main philosophies and institutions such as the 'Ibadat Khanah', 'Din-I-Ilahi', 'Jhakora darshan' and the policy of liberal patronage to indegenous arts and literatures were founded, for all of which Fatepur Sikri was the setting. The city is comprised of 3 main complexes which were laid out as terraces in accordance with the sloping ridge. The Mosque complex was sited at the highest level and comprised of the Buland Darwaza, the Jama Masjid & the tomb of Sheikh Salim Chisti. The Royal complex was situated at a lower level and housed the Palace for the queen (known as Jodh Bai’s palace), Mariam’s house, Raja Birbal’s house & the Stables (though some sources credit the stables as having been spaces for the servants and attendant maids). The Public complex is at the lowest level and consists of the magnificent Pachisi court, the Panch Mahal, the Diwan-i-Khas, the Diwan-i-Am and the Anup Talao. All the buildings are oriented in the north-south axis, following the direction of the ridge. The entire complex is a very calculated composition of perfection, dominated by a play of linear axises and changing vistas. The open spaces are contained perfectly by the built volumes without any ‘leaking’ of spaces. It is as if everything is forseen & calculated perfectly – every vista, every sight line, every volume and massing...all worked out beautifully. The spaces are monumental in scale overall, with the built spaces acting as magnets and point of references due to their anthropometric scale of elements. The overall result is that the whole composition is very comfortable for people, you feel part of the space, yet, the element of monumentality is always there to overwhelm your senses. There is a beautiful play of levels which is normally not found in Mughal architecture. The topography of the site, which is situated on a ridge, has been used to maximum effect, creating sunken courts and subtle changes in levels which are used to emphasise the architecture. The first structure in the Royal complex situated in the second level is the Rani’s palace, called as the Jodh Bai’s palace. This complex is the principal Imperial Harem of Akbar and has been wrongly ascribed to Jodh Bai who has nothing to do with Sikri and belonged to Raniwas or Zenani-Dyodhi. It consists of a large open quadrangle which is lined all around with single storeyed rooms, with double storeyed blocks at the centres and corners, to create an interesting play of volumes. The entrance is through the central block on the eastern side. The interesting thing with the entrance is that it does not open directly to the interior but follows a Z-shaped passage on the inside of the gateway structure. This was probably done to create a more private space in the inside for the women, shielded away from the exterior. On the west, the central block contains a small shrine, which is supported by richly decorated pillars. There are niches in this space, possibly for keeping images of deities. There are a lot of Hindu motifs used in this structure, which hints that the occupant was possibly a Hindu lady. On the north & the south side, the central blocks have a sloping gabled roofed structure on the top (which is very unlike any of the preceding Mughal architecture), which is finished with azure-blue glazed tiles. This structure is set back from the edge of the parapet, with 2 square chhatri with triangular domed roofs on either corner. There is an open terrace enclosed within these structures, which forms a very cosy space overlooking the open central courtyard. One can just imagine the occupants sitting in the Chhatris in the evenings, enjoying the setting sun, looking down on the activities in the open space below, while a gentle breeze blows through. The courtyard is compact, spaces well defined with a very humane scale. The transition from glaring light to shade to semi-dark to dark is one which creates a very interesting sensory perception, delineating the transition from public to semi-public to private space. Although the composition is extremely formal, the play of volumes helps in reducing the strict formality and gives the space a very comfortable serene ambience. As one moves from out of the palace and further towards the north, on the central axis of the courtyard is the Mariam’s house. This residential building is said to have been embellished with beautiful paintings and was also referred to as ‘Sunahara Makan’. The entire building is raised up on a plinth which serves to give prominence to the structure. There are 4 main rooms on the ground level and has a staircase which leads up to the flat roof. There is a single rectangular open pavilion on the top, which was used for sleeping purposes during the summer nights. ﻿﻿On the central axis of the Mariam’s house, towards the West, through a colonnaded frame lies Raja Birbal’s house. There is a sense of anticipation as one moves forward through the space, along the northern exterior double height walls of the Jaodh Bai’s palace. The view is revealed gradually as one crosses the colonnaded frame. The Birbal’s house is again situated on a plinth and consists of a double storeyed structure. The structure is opaque with solid walls on the ground level punctuated with 2 arched openings on either side. On closer inspection, one finds that these walls are exquisitevely carved showing the finesse of the craftsmen. There are 2 domed chambers on the upper storey, with domes finished in light yellow sandstone, which act as a pleasant contrast with the red sandstone walls. These chambers too are solid with a small projecting balcony on the centre and lend a solidity to the entire structure which is in sharp contrast to the overall lightness present in other residential buildings of the complex. The open courtyard with colonnaded verandah all around - Stables or maid quarters? Yet, 40 years on, Mother’s grand vision still remains unrealised in totality, although the basics are in place. The township is a magnet for people from various parts of the globe seeking different things, creating a microcosm of the universe. It is home to around 2000 Aurovillians; the permanent residents, and has a floating population of around 10000...there are people with varied interests – artists, writers, architects, travellers, musicians etc; people with different religious values and languages; all adding to the variety and diversity, creating a mutually harmonious existence called Auroville. One of the first things that you notice when you reach the place is that...you seem to be lost in the middle of nowhere..Its trees all around – nothing but trees. The various shades of green being contrasted with the deep red of the earth. Yet, it is a far cry from the barren landscape the early pioneers of the township found when they started out. The passion, courage and faith of these people who believed, is something to be marvelled at, to be admired. Auroville is an amazing example of how nature can be rejuvenated and brought back to life through human intervention. Through a massive afforestation drive, the barren land was brought to life. Water harvesting techniques were used to save the rain water which normally would have run down to the sea barely 8km away. The process is still going on...there are dedicated areas where forests are cultivated, bunds are created to store the rain water, soil nourishment happens.. The Matrimandir forms the nucleus of the township. This golden shaped dome is at the centre of the Aurovillian universe from which all things radiate out. The township is divided into various communities; each nestled in between the large forest of trees, connected by dirt roads. Architecture plays a major role in these communities, with each community having their own individuality – be it in form, material, technology etc. Yantra, Prayatna, Courage, Creativity, Acceptance etc are some of the communities...There are also guesthouses around where the visitors can rent for their stay. 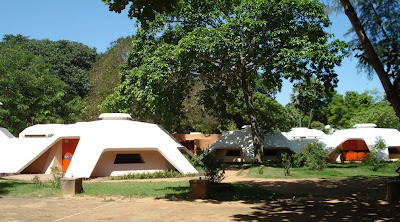 Auroville is a happening place as far as architecture is concerned. Since its initial inception, architecture has always been at the forefront of Aurovillian development – right from the shelters made by the pioneers to all the various research that is happening presently. A lot of interesting techniques are practised here, which are lost in mainstream commercial architecture practised elsewhere. Here; nature, materials, ecology, society, culture...all play a part in evolving a true appropriate architecture. There is a freedom to experiment, a freedom to ‘not conform’...which often gives rise to a lot of innovative design & research happening, especially with alternate materials and technology. Earth architecture, ferrocement, vaults, domes, filler slabs etc are some really interesting stuff. Energy, especially alternative energy forms a big part of Auroville. 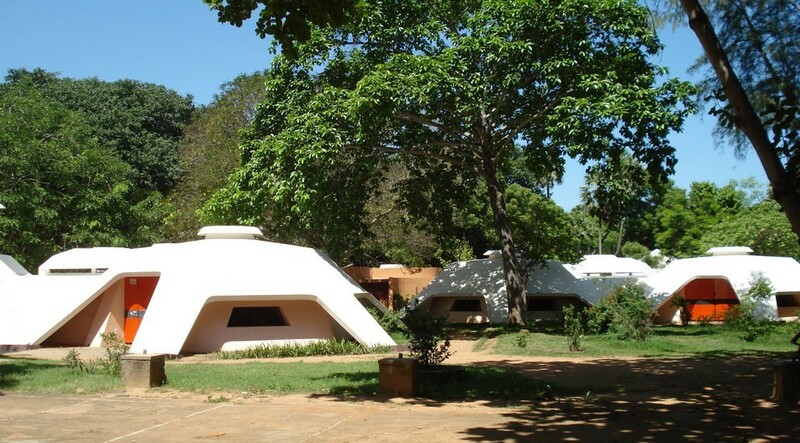 What the world is now realising in terms of climate change and global warming, people had realised here long ago and were practising a lifestyle in tune with those principles – the main difference being that here in Auroville, they really believe in what they preach and practise. There is even a ‘Solar Kitchen’, which is a large community kitchen, where all the cooking is done with the solar energy captured by a large solar disc. Waste segregation at source is a very simple concept practised here that has so much scope for implementation across all cities. Here, plastic wastes are segregated from organic wastes and are disposed off and recycled separately. Windmills; an image from our childhoods, are seen peeping out from the tree tops. They are mainly used for pumping water. The media is playing a very important role in how urban India perceives what architecture is. They are full of adverts and articles promoting high-rise apartments and swanky new commercial complexes. They are full of images of tall glass & ACP clad structures, innumerable housing projects that are sprouting up at each nook & corner. There is a constant bombardment of visuals in both the print & electronic media. However, through all this, behind all this, the media is indirectly manipulating public opinion and aspiration by its constant bombardment of visuals and information. Its like, if you want to be called successful, you need to be living in an apartment, one that boasts of a swimming pool. This, regardless of the fact that there may be acute water shortage in urban areas. And to take matters further, one is further enticed that if you own one flat already, you need a second one as an investment option. The projects that are coming up today are also reflecting these unbalanced desires. There are luxury housing projects which boast of lavish golf courses inside, all totally ignoring the amount of water and power required just to maintain such facilities. By constantly bombarding people’s senses, the media is making the people believe what it wants to believe, aspire for what it wants them to aspire so as to maximise their own profits and those of their invisible masters. Gradually, the ability of people to make a choice for themselves about the kind of habitation they want is being carefully manipulated to suit the needs of the developers and real estate players, by a media which is under their payroll. The effect of this is that an artificial demand is being created, a bubble, which pushes up the prices of land and liveable space in all our urban areas. All the usable land inside our cities is presently more or less used up. The developers have thus already turned to taking over agricultural lands, as was seen in the recent farmer agitations in Greater Noida. The agitations were for obtaining the right price for the agricultural land taken up for real estate development. In the agitation and its subsequent media coverage, we seem to have missed a crucial point totally. The bare truth remains that land which was to be used for agriculture was taken over for building construction. There is not even a question raised over whether this is ecologically feasible, whether this is good for our cities in the long run, whether the modification of the landuses will not give rise to other anomalies? All these questions have been blithely ignored and covered up by the media. And what of the disruption and displacement caused to the farmers? The issue has been oversimplified as to one over adequate compensation, when other far graver issues like the loss of livelihood of the farmers, displacement and resettlement of these farmers, impact on their lifestyle, loss of social structure etc, have been pushed to the background or worse still, haven’t even been raised at all. By paying direct compensation (which goes to the men in the family), it further puts the women folk at a huge disadvantage. The liquid cash in hand is blown up on alcohol and unwanted luxuries without thinking about the future, often leading to families ending up literally on the road....why arent the media with their experts unable to see this? Is it because they do not want to see? Similarly, the aspiration for the concrete box is one of the media’s creations. The subsequent loss of vernacular architectural forms due to blind usage of concrete is largely as a result of the misinformation campaign in the media. Instead of turning to local resources and building materials, the media celebrates foreign imported materials which are ill suited to our climate and context. ‘Expert’ opinions are given by ill-informed experts, which are then vociferously propagated and endorsed by the media establishment, leading to the kind of non-architecture that we are witnessing in our urban spaces. The lack of urban infrastructure, the loss of personal space, the lack of sanitation etc are issues which do not interest the mainstream media today, unless there is the element of sensationalism to it. The media needs to play a far more proactive role to check the overexploitation of resources and to expose the mechanism of greed that has beset our real estate sector today. The media also needs to remember that in a democracy like ours, the media has a very important role in presenting a balanced picture to the citizens so that they can make an informed choice, to act as a check for unbridled greed. The kind of brainwashing and propaganda that the media is presently carrying out very subtely needs to be stopped. By reducing the people’s faculty of thought, by controlling it, by manipulating it to suit its own agenda, the media is doing a great disservice to the country. With a booming economy and increased purchasing power, the demand for housing, infrastructure & allied services in our urban areas has increase manifold. The real estate & construction sector is in overdrive to cater to this increased demand and consequently, opportunity. Housing & infrastructure projects are sprouting up all over our cityscapes. Multi-storeyed buildings, rising up to the skies, are being readied to meet the demand of the urban consumers, large scale road projects and flyovers are changing the face of our cities. We only see these concrete & steel structures rising up at a frenetic pace. But behind this frenzied activity, there is an army of unseen labourers, who toil away to convert these paper dreams into reality. They are the faceless millions who form a behind the scenes economy, who no one likes to talk about or acknowledge. They are the countless numbers who have left behind their villages & agricultural backgrounds in search of a more stable and satisfying life. Yet, on reaching the cities, they are taken en mass to construction sites, where they toil away for over 12 to 14 hours per day in extremely demanding work environments, with scant regard to their safety and needs. Most of the companies engaged in the construction industry, apart from the large well established companies, do not follow basic safety norms, neither do they pay attention to the welfare of the labourers, often exploiting them to maximise profits. These labourers are most often put up in shabbily erected labour colonies, where they are crammed into minimal spaces, often tin covered shelters, which offer scant protection to the baking heat in the summer nor against the water from the rains or the bitter cold. They are devoid of basic necessities & services, with often rudimentary unhygienic sanitary conditions present in the so called accommodations. The impacts of these demanding environments are especially felt on families. Most often, the women are also employed along with their men in construction sites, just to make ends meet. This often places them in a sticky situation, especially when it comes to taking care of their children and infants. The women are forced to take the toddlers along with them to the construction sites, where the kids grow up amongst the gravel, dust, machineries & noises. Most often, the situation becomes dangerous and accidents are not unheard off. However, the greater impact & loss is that these kids do not get the opportunity to go to a school, as theirs’ is a migrant life, moving from one construction site to another. This migrant population affects the carrying capacity of our urban areas a lot. We are all aware of the pathetic flight of the construction labourers in places like Dubai during the construction boom. The situation in a place like India is slightly different, as the labourers coming into the cities lead to large scale urbanisation and mainly due to the fact that, unlike Dubai where the workers return to their native countries after the work, here, the workers become a permanent part of the city, often settling down in slums and other unorganised settlements. The urban areas are thus forever expanding, bursting at its seams, though not due to the influx of the workers alone. The lack of planning is highly evident as the sprawl keeps on increasing. The overall effect of this is a loss in quality of liveable spaces, more strain on resources and ultimately the quality of urban life. The efforts to regulate the construction industry have led to an increased awareness of Environment, Health & Safety issues regarding the workers. Yet, in spite of this, at the ground level, the situation hasn’t improved a lot. There are rules for giving Provident fund and insurance to the workers, as stipulated by the government, and also minimum wages for the labourers. However, these most often remain on paper and are not implemented. Even if they are followed by the companies, the benefits to the workers are not paid by the contractors and middlemen who employ the workers at site. The workers thus stand to lose. With regards to accidents in the construction sites, the situation is even worse. Even though insurance exists in name, in the event of any accident, the worker is left to fend for himself. He may be taken to the hospital but the costs may not be borne by the employers. The indirect effect on the worker due to loss of income during the hospitalisation and recovery periods is even more unbearable and damaging. It is thus high time that we paid increased attention to the issues surrounding the labourers in the construction industry. As a start, a better implementation and compliance of policies & regulations which are already framed will go a long way in addressing some major concerns. Simultaneously, we need to analyse the impact on urbanisation and the effects on our urban spaces, which will help us in arriving at more wholistic solutions which are suited to our context. We need to ensure that we start gradually moving towards a more organised construction sector, which will ensure sustainable and equitable growth for everyone. Merely turning a blind eye towards the ground realities and procrastination will only further compound the problems.